UCanCode Software focuses on general application software development. We provide complete solution for developers. No matter you want to develop a simple database workflow application, or an large flow/diagram based system, our product will provide a complete solution for you. Our product had been used by hundreds of top companies around the world! "100% source code provided! Free you from not daring to use components because of unable to master the key technology of components!" An extension to the GDI DrawText. 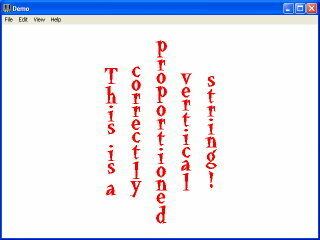 Did you ever want to draw vertical text, but the output was out of proportion? Here is the answer. A simple function written in plain Win32, no MFC required. The function behaves almost exactly the same as DrawText(), with the exception that the output is vertical. This started out when I wanted to print tables. The data within my app had its own method of being displayed, so it seemed pointless to add support for tables; I instead opted to draw them. A line here and a line there, it was easy and quick. The problem came when I wanted to insert the header text. Many English words are too long to be displayed horizontally in this manner, going vertical was the most reasonable thing to do. But I found no function capable of doing this with a pleasant output. So I made my own. The parameters are almost identical to DrawText(), with the exception of the last two. The string provided to lpString must be NULL terminated. The function is fully MBCS and UNICODE compatible, so don't worry about your build configuration. To divide the string into columns, just do the same as you would with any other string. Anywhere you want a new column, add a newline character '\n'. lpRect defines the area within which the function may draw. For best results, keep this rectangle as small as possible. Passing the whole client area will only serve to use up your processor time. HcharSpacing and VcharSpacing allow you to define how far apart you would like the characters and columns to be. Passing a value of 0 will result in the characters touching each other. For best results, leave them at their default values. The code will kick into a loop, drawing each character to a small monochrome bitmap of screen. Each of the bits is examined in this bitmap to determine the width and height of the character. Note, any character from any language will work, provided you have the correct locale set. The dimensions of each character are stored. When this loop is complete, the character positions are calculated relative to the longest line and the character spacing entered by the user. All that's left is to call the regular DrawText() function for each of the characters, drawing them to the newly calculated positions. I think I have fixed them all in the new version. Removed all the slow off-screen drawing, implemented a storage of positions in its place. Added the DV_TEXTJUSTIFY and DV_DOUBLEBUFFER flags. Corrected the problem with Italic fonts. Corrected the problem with the background mode. Copyright ?1998-2019 UCanCode.Net Software , all rights reserved. Other product and company names herein may be the trademarks of their respective owners.